Is the ground rent ban responsible? I guess when you stand down as boss of a publicly quoted retirement housing company that has seen profits fall from £110 million to £65-£80 the headline-writing punsters are not going to miss a trick. So, Clive Fenton, 60, McCarthy and Stone’s CEO, is being “pensioned off” or “retired” and his achievements forgotten. We have no insight into whether Mr Fenton is quitting or has been given the push nor, frankly, do we care that much either way. The investors in McCarthy and Stone are buying into a flawed retirement housing business model – one that has been flawed for its outset, we would argue – and with the government calling time on the ground rent game a different approach is clearly necessary. That might have motivated the money men, but more likely they are just disgruntled over the falling profits, which probably no one could have halted anyway. We would like to pay tribute to Mr Fenton, who made his reputation at Barratt before joining the retirement house builder, both as LKP and on behalf of retirement leaseholders. For a start, Mr Fenton will always be owed our thanks for drawing to an immediate close some highly aggressive legal bullying. Before his appointment in 2014, our sister organisation Carlex (whose editorial is maintained on www.BetterRetirementHousing.com) was involved in a fractious dispute with McCarthy and Stone and the so-called Campaign for Housing in Later Life. It was a disastrous initiative even though it had roped in Esther Rantzen, now the “Brand Ambassador” for Churchill Retirement Living, to front the initiative and there had been a starry launch at Westminster involving Jack Dromey, then presiding over Labour’s housing policy. As it happened, the campaign was boycotted by Age UK, Shelter resigned from it and Peverel Retirement / FirstPort was expelled because it had just been found to run a bid-rigging scam that had cheated retirement housing leaseholders out of £1.4 million. Last Friday, Peverel was expelled from the Home Builders’ Federation campaign to reinvigorate the retirement housing market. Its logo was removed from the campaign’s website, while earlier in the week the homeless charity Shelter also decided to jettison the campaign. AgeUK – which last year removed its logos from the Peverel Retirement site – had declined to get involved. The charity Shelter appears to have ceased involvement in the ‘Campaign for Housing in Later Life’, which Campaign against retirement leasehold exploitation revealed on April 9 registered its website to the Bournemouth HQ of McCarthy and Stone. The Shelter logo that appeared on the ‘Campaign’s’ website has been removed. UPDATE June 8: McCarthy and Stone points out that over the credit crunch period (the five years between 2007/8 to 2011/12) it sold 7,170 properties. The company takes issue with Campaign against retirement leasehold exploitation’s view that there has been “almost NO demand” and that “schemes have not been sold”. McCarthy and Stone employed the media law firm Lewis Silkin to rough up Carlex and a barrage of highly aggressive letters ensued. They may have cost the company as much as £40,000. Mr Fenton, newly appointed as CEO, realised that this was a disastrous course of action against an organisation with minimal resources but strong political backing. He ordered a halt, and dispensed with the executive who had ordered. So, from a personal viewpoint, LKP / Carlex had good grounds to be grateful to him. But he also initiated other improvements. He realised that the sale of freeholds to the Tchenguiz Family Trust, based in the British Virgin Islands, had tarnished the brand. Just as it had the Berkeley Group, which builds prime sites in London. With the Tchenguiz organisation also then owning Peverel, the former customers of McCarthy and Stone were entirely under their control. Mr Fenton introduced reforms. He ensured that all new sites had a head lease retained by the company so that it appointed the management of the sites. Freeholds were still sold off for the ground rents, but the freeholders had no say in the management of the sites. Instead, they were managed by McCarthy and Stone Management Services. Mr Fenton also ensured that all leases were sold at 999 years, ending the short 125 year leases which are such a lucrative sweetener to speculators in freeholds: the third or fourth owner is likely to have to extend the lease. It was unfortunate that McCarthy and Stone then over-egged the putting by describing these 999-year leases as “virtual freehold”, an utterly misleading term also used by other housebuilders such as Persimmon. As with Persimmon this nonsense was dropped following our complaints. Although we have failed to get the Advertising Standards Authority to ban the marketing term “home ownership” when selling leasehold tenancies, we had better luck ending the egregious nonsense of “virtual freehold”. Mr Fenton made other improvements. He reformed a peculiar aspect of McCarthy and Stone leases: if families sublet the properties – to help pay for an elderly relative’s further care, for example – one per cent of the purchase price or value has to be payed into the site’s contingency fund. So we have had hard-pressed families having to pay out £3,000 just to sublet a tenancy. It is an absurd and onerous sum, although it does not benefit either McCarthy and Stone or the freehold owners: it just goes into the contingency fund. Mr Fenton saw the injustice of this and ended it in future leases, although plenty still exist in the historic portfolio. Other issues we could not agree on. The resale values of McCarthy and Stone, and Churchill, flats are frequently dismal. 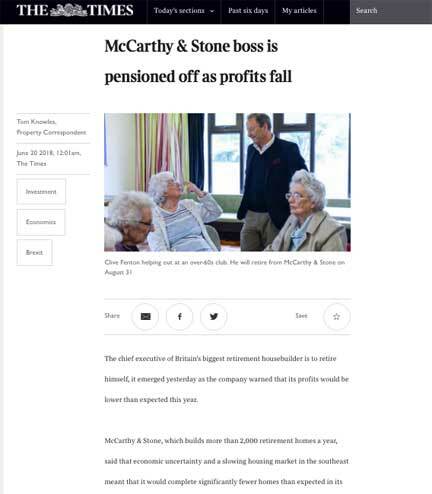 SUSPICIOUS that those ubiquitous McCarthy and Stone retirement homes were a bloody awful purchase I asked readers in Friday’s column for their experience. And my suspicions were confirmed – in spades. Back in 2008 the parents of Geoffrey Alderton paid a handsome £250,000 for a retirement apartment in Clacton-on-Sea, Essex. It is a good thing that the elderly communally; it is appalling that these properties, which are more expensive new than equivalent local properties, plummet in values. Again and again we encountered sites with dire resale values. The company argues that most values increase, but restrict the chronology to produce favourable figures. We are only interested in the figures reported on the Land Registry, which tell their own story. Ground rents are another issue where we are never going to agree. McCarthy and Stone says that they are essential for its business model, but we doubt whether it is going to persuade government on this. Ground rents are for no defined service whatsoever. They have been abused by virtually every builder in the country, and they have been loaded on to the abomination of leasehold houses. Their time is up and they need to be got rid of. This will hit McCarthy and Stone profits hard: the company makes £30 million a year in ground rent sales. The newish chairman Paul Lister is considering other options: rental and licences to occupy. There is a conference today to consider these options at a conference from which LKP is excluded – and ARCO, the Association of Retirement Community Operators, which opposes ground rents. Our view is: charge the proper price for your products and let the market decide. If ending ground rents means McCarthy and Stone and Churchill flats cannot reach the prices they want, so what? There are far more important considerations in retirement housing than the desired amount of profit from developers and their financial backers. Besides, Mr Fenton may be considered to have done well to reach the figures that he has. No less a figure than John McCarthy, the founder of this problematic company, doubted whether McCarthy and Stone had a future at all after he sold out for a billion right at the end of the boom. Mention is made in your article of the disastrous tie up between Peverel/Firstport and McCarthy & Stone. It is right to that Mr Fenton’s attempts to mitigate the problems ensuing from this are acknowledged. That said it is deeply disturbing that Paul Lestor is a director of Knight Square who owned Peverel/Firstport..
As to why Mr Fenton has left his post is of course open to speculation? One theory is that Monday Morning he was informed that I, “The Scourge Of Peverel” had accepted an invitation to meet him. Monday afternoon he quits! “Our view is: charge the proper price for your products and let the market decide”. The proposition put forward (by builders and their business friends) that leasehold properties are sold cheaper than freehold is, of course, bogus, and an evil deceit. Sebastian has called their bluff by suggesting they “charge the proper price and let the market decide (what that proper price is)”. Ask the hundreds of thousands who bought their houses CHEAP because they were leasehold – and are now suffering dire consequences, would they have preferred honest upfront prices at the outset, or the calamity they bought into? And those “honest upfront prices” (for freehold houses), as Sebastian infers, would be little different from the prices they paid for leasehold. The contract for the sale of the group’s H2 freehold reversionary interests have now exchanged with a total cash value of C £30m and completion is expected prior to the year end in August. So their you go folks, so much for peace and tranquility? It does rather look like to raise money to make up for any financial shortfall McCarthy & stone residents have had their homes sold from underneath them? And of course the company buying up the freeholds are not doing it for the residents benefit? Like the sharks that they are, they smelled the blood of a company that is facing problems. and you can bet they are going to exploit residents for all that they can? The figure £30 million is the similar figure that Firstport received for the sale of the Residential House Managers Flats in May 2018. My very elderly relative who in 2005 purchased a one bed flat for £138k is now looking at the sale price around £85k to £95k which shows a massive loss of equity? This may be representative of all M&S flats sold during the 1980s that had a Peverel now Firstport link and a Freehold in Fairhold Ltd.. I notice that Clive Fenton is due to speak at the next APPG meeting to defend Ground Rent charges to Retirement Flats. Let’s hope his views will now soften and he can agree that there is nothing to substantiate these charges. There are thousands still left in the mire with the pre Fenton business model at McCarthy $ Stone. All freeholds sold off to the Tchenguiz portfolio seem to have the worst of all worlds. Take Laurel Court development in Folkestone for example. The 70 odd flats built there in 2006 to date have lost over £700,000 on re-sales alone. (Just go to Land Registry and do the maths..) Residents recently had to pay a nice £13,000 charge to replace light bulbs to LED lighting – a nice upgrade for the landlord at a cost to the leaseholders. The local Firstport manager Tania Wytchell, schmoozes the elderly residents that this is some kind of benefit to them. Even with the efficiency of LED lighting, and the annual lighting cost of around £14,000, this will take some years to balance the books in savings. McCarthy $ Stone just aren’t interested in the damage to their brand and fob off the poor performance of the re-sales losses in Excuse Book 101. 1. Local Agents don’t market the properties to full potential, 2. Lifestyle Choice – Like a car or washing machine, these properties will lose value. 3. Property crash in 2008 (In contrast to all residential freehold property in the area now exceeds the post 2008 crash prices). The fact is that the last remaining unsold flats were sold off at a massive 46% discount at £99k. (Again check the Land Registry). When those flats came up for re-sale, the owners could afford to sell at £99k or even a small loss to get rid. Leaving existing owners to compete on a race to the bottom on prices, especially if you bought in at £163k! These are the type of shits we are dealing with. No regard for the brand or existing customers, left to deal with offshore based landlords. To them its just a fair days work. Fortunately, the OFT forced Fairhold, the landlord, to reduce the subletting costs in 2013, dispensing with 1% contingency fee to one months equivalent rent and a sublet fee of £85. I for one welcome the abolishment of ground rents on all properties, historically and including retirement properties. WE must take profiteering out of leasehold. I have a full list of the properties McCarthy $ Stone sold under this tenure and currently doing the research on the drastic losses on re-sales, which is pretty damning and going out to editors in the very near future. McCarthy $ Stone must pay the price and I am not going to leave them in peace, ever. It’s obvious, sell freehold, sell more properties. They would prosper! Other countries have proved this.